Tires are the only physical connection between your car and the road. Because of this fact, knowing when to replace tires is extremely important. Often overlooked, tires play a key role in not only the safety of the car, but the handling as well as the quality of the ride. In addition to performance, comfort, and safety, there is an impact on the economy of the car; on average, a properly inspected and inflated tire yields approximately 3.3% savings in fuel economy. With so many reasons to keep your tires in great shape, it’s extremely important to inspect for bad tire symptoms, which provide an excellent indicator that it may be time to change your tires. But don’t worry, in this article we cover what you need to know. There are four symptoms that indicate tire wear problems that you can perform at any time if you know what to look for. To check tire air pressure, use a tire pressure gauge. These are pretty cheap, and vary from basic models to more expensive electric versions. To find the correct air pressure for your car, check the sticker on the door jamb of your car (where the door touches the body). There you can find the recommended air pressure for your car, which is usually listed for “cold” tires (when you haven’t driven enough to heat the tires up). In addition, it is also important to check the maximum air pressure (measured in pounds per square inch, or PSI) of your tires, which is located on the sidewall of you tires. This number does not reflect the best pressure, but sets limits for the integrity of the tire and the safety of the passengers, so it’s best that you do not go over this number. To successfully read the air pressure of your tires, press the gauge down on the valve stem of the tire. Be sure to apply enough pressure to the valve so the air is released, and then take the measurement using the gauge. To check tread depth, it is recommended to either take it to a certified mechanical shop, or purchase a tread-depth gauge. To operate this gauge, simply place the measurement tool inside the tread, and extend the tool until it touches the deepest part of the tire’s groove (sometimes called the tire carcass). You then read the measurement. A make-shift alternative is to use a U.S. penny; place the penny into the tread, and if the entire head of Abraham Lincoln is visible, you must replace your tires. Tires often crack as a result of underuse and environmental conditions such as extreme heat, extreme cold, UV rays, and constant stretching and pulling. Tires are actually manufactured with an anti-aging chemical agent within the tire compound, and this helps maintain tire health. When tires are used regularly, the agent becomes more effective and this helps maintain the health of the tire. 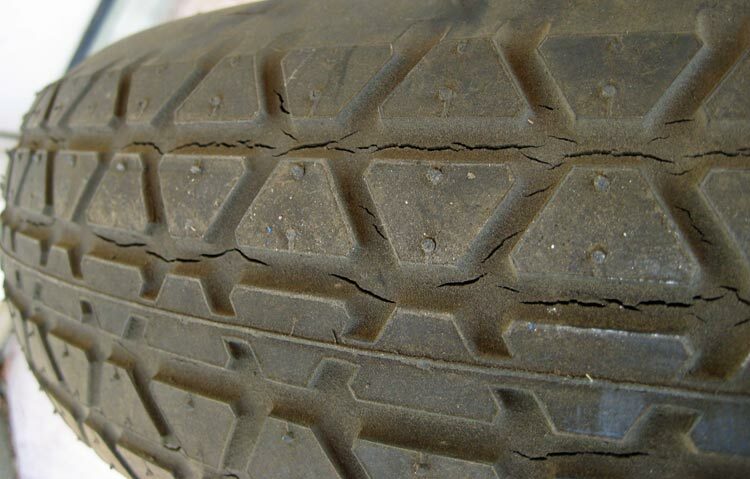 Although cracks may be only cosmetic, if the crack is deep within the tire, it can be a safety hazard. When this happens the tire should be replaced. Abnormal tire wear can come from many sources: over inflation, under inflation, and even poor suspension. If you notice that the outsides of your tires are worn more than the center, your tires are under inflated. If the opposite is true, and the center is smooth, your tires are over inflated. If you notice “cupping” or several smooth patches around the tire, your suspension settings aren’t correct and it is causing an inconsistent ride. Knowledge is the most important tool in any garage, and knowledge of your car and its components is the first step to safer driving and a more pleasurable experience. Don’t let your safety or the quality of your ride suffer; be sure to regularly inspect your tires for tire wear symptoms and replace them if needed. If you notice any of the warning signs above, and are ready to begin shopping for high quality replacements, be sure to consider BE FORWARD’S wide selection of used tires.